This tweet from a participant at the ongoing International Qur’anic Studies Association conference in the USA. Do the scholars there realise the implications of this observation? Consider this: an illiterate uneducated Arab trader from an obscure backwater of the Arabian peninsula could read ancient Hebrew well enough to appreciate a pun in Genesis 18?! I don’t think so. The implications are very suggestive. Which is why secular scholars think the Quran is too complex to have been composed by an ignorant, illiterate Arab businessman. Does he mean the meaning of the name Issac in Hebrew? So mohammed was not illiterate? Also, is the quran a person since it apparently has the capacity for awareness? My response was to the insinuation that this idea of isaac/laughter in the quran is somehow indicative of divine authorship. It isn’t – at most it shows that whoever wrote the quran had some familiarity with jewish texts. An illiterate trader (Muhammad) cannot plausibly be expected to have read and understood the Hebrew word play in Genesis 18. Dr Devin Stewart is a professor of Islamic studies and Arabic language and literature. His research interests include Islamic law, the Qur’an, Islamic schools and branches and varieties of Arabic. If you found this information interesting , you will love Quran 14:39. Abraham (as) thanks God for Ishmael (as) and Isaac (as) and then says that God is the one who hears the supplications. See the Hebrew meaning of Ishmael embedded in the text. Not everyone is as gullible as you appear to be. Either mohammed was not illiterate, or he was intelligent enough to understand the isaac/laughter wordplay explained to him. There is no evidence of divine authorship here. It is generally agreed in academia that Moses is an Egyptian name. we know from multiple historical sources that Muhammad was illiterate. There is no evidence that he understood Hebrew and spoke the language. He was far from endorsing what the Jews told him about the Torah. Why do refer to historically dubious traditions to support your claims about the corruption of the bible? This is merely another case of muslims abandoning the word of their god in favour of the traditions of their human prophet and his band of merry men. The quran is confused about the previous scriptures it both states explicitly that the torah and gospel are legitimate revelation – muslims disagree with their god and disobey him by claiming that the quran says the bible is corrupt. This is found nowhere in the quran. Following mohammed turns muslims against allah. The Quran, Sunnah, and testimony of the Companions are clear that the original Revelations given to the People of the Book have been either lost, corrupted, or forgotten. I’m not interested in human religious traditions that were condemned by out Lord jesus. Where does the quran say that the previous scriptures are corrupted? It doesn’t. It does. Click on the link and read the evidence. Don’t be a donkey. None of those links are convincing. Go on, be a devil, make a convincing argument. Don’t be a liar. You could not possibly have read them. I’m not going to try and educate a donkey. I have better things to do. Not really. As noted by Prof.Walid Saleh, the vast majority of secular academic scholars believe the Quran considers previous scriptures corrupted. Brother Paul, get Coco’s classification right. He is a monkey, not a donkey. Please keep that in mind. I am so sorry. I fear I have just insulted donkeys. I’ve read that website a long time ago – it isn’t convincing. Appeal to authority fallacy. Where does the quran clearly state that the previous scriptures are corrupted? It doesn’t. One of the most common arguments that Christian missionaries pose to the Muslims is that Islamic teachings allegedly affirm the authenticity and divine nature of the Bible that Christians follow today (I’m not sure if they are referring to the Protestant or Catholic version or both. I guess it depends on with which Christian you are debating.). There seems to be a misconception amongst Christians. They think that Islam teaches that there once was an original Bible and then the Bible got corrupted. This is not what Islam teaches. We don’t believe that there was an original book of Philippians or Corinthians, which then later on got corrupted. We don’t even believe that these books are divine in the first place. What we believe is that parts of the original revelations sent down to Moses (Torah) and Jesus (Gospel) peace be upon them both still exist in the Bible today. We believe that people came and wrote things from their own and claimed that it was from God. They then went and mixed their own writings with the original revelations (Torah and Gospel) and removed and added to them. The Arabic word most commonly used in the Qur’an and Hadith to state that the Christians and Jews distorted their books is Tahreef. 3.6.1.1 In the Language – to change or alter. 3.6.1.2 Technically here – to change the texts in wording or meaning. This is of 3 kinds. 3.6.1.2.2 Altering the words with no change of meaning: e.g. changing the Dammah on the last letter of “al Hamd” in (1):2, to a Fathah. This usually occurs out of ignorance. Note how Shaykh Ibn Taymiyyah in the first two kinds of Tahreef shows that the Tahreef could mean changing the letters of the statement (textual corruption) and in the third kind it is misinterpreting the meaning of the statement. Al Baji says in his commentary on Muwatta’ Maalik. Here we see that Imam Baji is speaking about how the Jews used to say ‘Assaamu Alaykum’ (may poison be upon you) to the Prophet Muhammad peace be upon him and then states that their changing of the letters is a kind of tahreef or distortion. So its not simply a matter of just misinterpreting a statement but actually changing the letters around by either deletion or addition. So as we can see, the distortion could either be by interpretation or textual corruption. What I will be doing in this article is presenting evidence from the Qur’an, authentic statements of the Prophet Muhammad (peace be upon him), statements of the companions of the Prophet peace be upon him, the early Muslims and prominent Muslim scholars to show that Islam does teach that the Christians and the Jews textually corrupted the revelations of God. I urge the readers to remember that this is not about whether the Islamic claim of textual corruption is true or not, but whether Islam makes this claim or not. The outline of my article will be as follows…. The greatest source of religious authority in Islam is the glorious Qur’an, the verbatim Word of God. In this section I will only pose two verses as evidence. The reason for this is because it is clear from the verses themselves without need of interpretation that the Qur’an endorses textual corruption of the Christian and Jewish scriptures, while the other verses would need us to appeal to commentaries and see how the early Muslims understood those verses (will be discussed later on in the article). As for now, we will only look at the apparent meaning of the verses. Therefore woe be unto those who write the Book with their hands and then say, “This is from Allah,” that they may purchase a small gain therewith. Woe unto them for that their hands have written, and woe unto them for that they earn thereby. Here we clearly see that Allah is warning those (Jews) who wrote the scripture from their own selves and then claimed that it was from God. A clear charge of TEXTUAL corruption. The verse is clear is clearly stating that whatever the Jews wrote, they claimed it was from God. “Not all of them are alike. Some of the People of the Book are an upright people. They recite the signs (or verses) of God in the night season and they bow down worshipping. They believe in God and the last day. They command what is just, and forbid what is wrong and they hasten in good works, and they are of the righteous. In no way, do these verses suggest that the People of the Book that believed in the Prophethood of Muhammad peace be upon him had the complete correct text of the Torah with them. For all it shows is that they understood the text properly or were aware of what the true Torah contained by oral traditions (e.g. their rightly guided parents). The Qur’an is not stating that there was a Torah corrupted textually and a Torah not corrupted textually. Nor does it say that the righteous people of the People of the Book ever participated in the corruption of the Torah. It does not require that ALL of the People of the Book come to corrupt it. A few people with great authority and power (we will see this later under the Ibn Abbaas’s section) can achieve this task. – The Qur’an states that the Jews wrote ‘The Book’ with their own hands. – ‘The Book’ referred to in the verse is ‘The Book’ being mentioned throughout several verses in the Qur’an in the possession of the Jews. – The Qur’an states that the Jews after writing ‘The Book’ from their own selves, then claimed it was from God. – ‘The Book’ is clearly then referring to the Jewish scriptures that Jews state are from God (i.e. Old Testament). Even if someone wants to go against the clear meaning of the verse, then the reader should continue reading this article and will see the various comments of the scholars regarding this verse and how they understood it to refer to textual corruption of the Torah. The verse is making it clear that the crucifixion of Jesus is conjecture or corruption. The crucifixion of Jesus is clearly taught in the Gospels that we have today, thus the Qur’an is clearly in an indirect way saying that this is corrupted. It is hilarious how some Christians try to argue back that the author of the Qur’an probably did not know that the crucifixion was mentioned in the Gospel and if he had then he probably would not have denied it. Are Christians seriously asking us to believe that none of the Muslims during the Prophet’s time knew that the gospels taught that Jesus was crucified yet at the same time believed that Islam told them to believe that the gospels in the possession of the Christians were pure and undistorted? Couldn’t the Prophet have easily been exposed by Christian converts to Islam such as Salmaan al Faarisi or Maryam the Coptic slave girl sent from Egypt to the Prophet peace be upon him who would have known that the gospels taught the crucifixion while at the same time believed that Islam taught them that the gospels were undistorted? How about being exposed Christians and Jews at the time who knew what the gospels contained and should have known that Islam taught their scriptures are uncorrupted (assuming Islam teaches this) and then go expose the Prophet? Why don’t we have any of these accusations from the Prophet’s enemies at that time? This is something truly ridiculous to believe and requires evidence by Christian missionaries who would issue such a response. The Qur’an gives authority to the Prophet Muhammad peace be upon him to teach (3:164) and make clear (16:44) the Qur’an to us. To know more about the importance of the Sunnah in Islam, please refer to my section here. We will look at some authentic Prophetic hadith that would attempt to shed some light regarding the topic. Notice that the Prophet peace be upon him is saying that the Christians and Jews distorted their books JUST AS they lied about their Prophets. The context of the situation is that the Christians and Jews said that bowing down to their priests and rabbis was the greeting of the Prophets. This is a forgery and a lie. Thus if they were to corrupt their books in the same way they would have made up lies in the Torah and Gospel by introducing false statements into it. Objection: The Prophet was only referring to a certain group of the Israelites. Response: The hadiths do not imply this, the Prophet peace be upon him made a general statement. If you want to limit the scope of the meaning of the statement then please provide objective evidence. Objection: The Prophet only said that the Jews wrote a book and followed it, he doesn’t say that the Torah was corrupted. Response: But what does the hadith imply? It implies that the Jews have stopped following the true revelation sent down to Moses and that is the Torah. Instead they followed their own books. Don’t the Jews of today follow the Pentateuch? Wouldn’t that therefore mean that according to the Prophet Muhammad peace be upon him most of the Pentateuch is what was written from the Jews themselves? Objection: It is possible that Prophet Muhammad intended the term ‘Torah’ to mean Pentateuch and the book that the Jews wrote was the Talmud and it was possible that Prophet Muhammad intended to say that the Jews stopped following the Pentateuch and started following the Talmud only. Response: That argument would be possible if it were true. The Jews refer to the Talmud in order to better understand the Pentateuch. They haven’t abandoned their Pentateuch. They still follow it. If the Prophet said that the Jews wrote a book and followed it along with the Torah, then you might be able to possibly argue that it is referring to the Talmud and Pentateuch in this hadith. However, that is not the case. Indeed, we do find in the Old Testament today that adulterers are to be killed (Leviticus 20:10). But nowhere do we find anything about four witnesses (interestingly Islam teaches this) or any eyeliner. This is indirect proof that this section of the Torah has been distorted with. Note how the man informed the Prophet peace be upon him that one of the signs of the Prophet to come according to the Torah or Gospel is that the Prophet will have 70,000 followers who will enter paradise with no judgment passed on them. Where do we see this in today’s Torah or Gospel? Nowhere. Thus indicating that it has been removed from the text, which in turn implies textual corruption. And (as for) the foremost, the first of the Muhajirs and the Ansars, and those who followed them in goodness, Allah is well pleased with them and they are well pleased with Him, and He has prepared for them gardens beneath which rivers flow, to abide in them forever; that is the mighty achievement. The Muhajirs refer to the companions of the Prophet peace be upon him that migrated to Madina. The Ansar refer to those Muslims in Medina that welcomed the Muhajirs to come to their city. So here we see that Islam teaches that the companions of the Prophet peace be upon him are the saved sect and were promised paradise. This is clearly because they understood and practiced Islam better than anyone else. They are a great authority to refer to. Obviously, this does not mean that the companions were individually infallible, however their consensus on a matter is. Here, we will see some of the perspectives of the companions of the Prophet peace be upon him towards to the Christian and Jewish scriptures. Volume 001, Book 003, Hadith Number 075. Book 031, Hadith Number 6055. Chapter : The merits of ‘Abdullah b. ‘Abbaas (Allah be pleased with him). Ibn ‘Abbaas reported that Allah’s Messenger (may peace be upon him) came to privy and I placed for him water for ablution, When he came out he said: Who placed it here? And in a version of Zuhair they (the Companions) said, and in the version of Abu Bakr (the words are): I said: It is Ibn ‘Abbaas (who has done that), whereupon he (the Holy Prophet) said: May Allah grant him deep understanding of religion. Here we see that Ibn Hazm reinforces the fact that Ibn Abbaas truly held this position and that even the companions of the Prophet peace be upon him held the same position as well. Thus, there was a consensus amongst the companions that the Christians and the Jews had textually corrupted their scriptures. ÃÍÏåãÇ: Ãä ÇáÃõãøí: ÇáÐí áÇ íßÊÈ æáÇ íÞÑÃ¡ æåæ Þæá ãÌÇåÏ æÃÙåÑõ ÊÃæíáå. Firstly: The word Ummi in the verse could refer to someone who does not know how to read or write, and this is the statement of Mujaahid and the more apparent interpretation. In his commentary on Surah 2:75 Imam Ar Razi quotes al-Qadi ‘Abd Al Jabbar (d. 415 A.H.) as affirming that Ibn Abbaas’s opinion towards the Christian and Jewish scriptures is that there have been additions and subtractions made to and from them. (Source) Again, clearly indicating that Ibn Abbas’s position is that the scriptures have been textually corrupted. So here we see that Ibn Abbaas talks about how the kings of the past used to force people to switch to their corrupted version of the scriptures. Clearly indicating that their scriptures contained writings, which were false, thus the scriptures that the masses were using were textually corrupted. Since the kings forced the people to switch to their scriptures or had them killed, this meant that the true uncorrupted scriptures became lost or possibly remained safe with a very few number of people, but it seems clear that the corrupted copies were distributed more widely. “By the Mount and an Inscribed Book” (52:1-2): Qatada said that “mastur” means “written”. “Yasturun” (68:1) means, “they inscribe”, and the Umm al-Kitab (43:4) is the whole of the Qur’an and its source. [He said that] “ma talfizu” (50:18) means: “He does not say anything but that it is written against him.” Ibn ‘Abbaas said, “Both good and evil are recorded,” and “yuharrufuna” (4:46) means, “they remove”. NO ONE REMOVES THE WORKS OF ONE OF THE BOOKS OF ALLAH ALMIGHTY, BUT THEY TWIST THEM, INTERPRETING THEM IMPROPERLY. “Dirasatihim: (6:156) means “their recitation” “Wa’iyya” (69:12) is preserving, “ta’iha” (69:12) means to “preserve it”. “This Qur’an has been revealed to me by inspiration that I may warn you,” meaning the people of Makka, “and all whom it reaches”(6:19) meaning this Qur’an, so he is its warner. This could be answered in more than one way. I did not find it with continuous chain of reporters (mawsoul) on authority of Ibn ‘Abbaas in spite of the fact that what is said before it is from his words as well as that is after it…. and all scholars of hadith have agreed that you cannot judge a narration to be authentic unless you have the complete chain of transmission to examine and then conclude if it is authentic or not (unless it is mursal and has specific conditions being applied to it or if it has other corroborating evidence). Imam Tabari in his commentary just simply quotes Mujahid ibn Jabr Al Makhzumi (d. 104 A.H.) who then quotes the statement. However, there is a 200 hundred-year gap between Imam Tabari and Mujaahid! Where are the two or three people who should have come in the middle of the chain? Secondly, it contradicts the authentic narrations and well-known position of Ibn Abbaas on the matter and that is that he believed that the Jews and Christians textually corrupted their scriptures. Here we can see that this alleged statement from Ibn Abbaas is one of those examples, therefore it must be rejected. Thirdly, Ibn Abbaas’s statement could be reinterpreted in order to be reconciled with the other statements that he has made. And that is that Ibn Abbaas intended to say that they changed what was in their hands of the text which was with them, but they could not change the original true text which is with Allah on al-Lawh al-Mahfudh (preserved tablet) since the speech of Allah is uncreated and no one can ever make it go lost completely and removing the words from the books here on earth does not mean that God’s words have become totally lost but lost here on earth only. Here we see that the Qur’an is also preserved in the Preserved Tablet from being corrupted and this strongly raises the possibility that this is what Ibn Abbaas was referring to when he made (assuming that he did) that statement. His intention was to say that the speech of God is in the Preserved Tablet (including the original Torah and Gospel) and cannot be changed. We must conclude by saying that the authentic narrations clearly indicate that Ibn Abbaas supported textual corruption and that one narration whose chain of transmission we cannot even examine should not be a cause for us to doubt that position of Ibn Abbaas. There are no explicit verses in any of those quranic quotes that say the gospel and torah are corrupted. I don’t adhere to the authority of the traditions or tafsirs – if allah cannot express himself clearly, why should I trust the opinions of scholars who worship such an inept being? All I am asking for is simple – quote the quran verses that support your claim that the quran teaches biblical corruption. Your wall of text (that has not intimidated me in the least, LOL!!) can only come up with two verses that offer absolutely no support for your claim. The evidence is actually very clear and detailed. Surah 2:79 & Surah 4:157. Many authentic hadith confirm this too. You fail to see it because you are a monkey. But even most western specialists in the Quran agree with the Muslim view. Just consult the detailed analysis in the prestigious Encyclopedia of the Quran. I have. But of course you will not. That speaks volumes about your weak mind and stubborn heart. Joel: Appeal to authority fallacy. Where does the quran clearly state that the previous scriptures are corrupted? It doesn’t. If the vast majority of scholars agree the Quran says previous scriptures are corrupted, then it is highly likely that the Quran does say previous scriptures are corrupted. Let me bring some Bayesian reasoning into this. Let A be the event, “The Quran doesn’t teach the bible is textually corrupted”; let B be the event, “Scholars believe the Quran teaches textual corruption of the bible”. Let P(A)= 0.5 and P(B)=0.7 where P(.) denotes a probability function. So I’m assuming there’s a 50% chance event A is true. I’m also assuming that 7 out of 10 scholars support event B. Assume P(B|A)=0.3 so there’s only a 30% chance scholars would believe the Quran teaches textual corruption of the bible if the Quran actually says otherwise. What is the probability that the Quran doesn’t actually teach textual corruption of the bible given that scholars believe the Quran does teach textual corruption of the bible i.e. what is P(A|B)? So there’s only a 21% chance that the Quran does not actually teach something that scholars say the Quran teaches! So what you are saying is that there are no quranic verses that support the contention that the bible is corrupted. or just some form of plagiarism?. LOL, in order to it to be plagiarism, the author would have to have known a Hebrew pun and included it in the Arabic text. Did you even read the comment by Devin Stuart. You guys are waaaaay out of your league here! ROTFL!! I love seeing ignorant buffoons trying to pretend like they know what they are talking about! Plagiarism would be referring to Jesus “coming with the clouds”, which was how Baal was described by the Canaanites. He was known as “storm rider”. Also, referring to God as an old man who gives authority to the “son of man” is borrowed from the Canaanite myths about El. Something copied from the bible appears in the Koran. Big deal. So what? What do you expect? What is there to marvel at? give me one example of where the Quran copies a verse from the Bible. Given the high quality and complexity of Quranic language, rhetoric and insights, it is highly unlikely the Quran was copied from the bible which is linguistically nothing extordinary on top of being laden with amusing blunders. Of course it doesn’t copy word for word but just re-writes the biblical stories with a view to stereotyping Mohammed’s prophetical characteristics and giving Mohammed him some historical roots to legitimize his message and person..
oh so no copying then. Just correcting the Bible where it has distorted or misrepresented the original. Perhaps qb clevercloggs can explain what I am supposed to find marvellous? Why does an bArabic book, renowned for its literary prowess, refer to a Hebrew literary device? The author would have had to have a sophisticated understanding of both languages. So that could not be Muhammad (pbuh). Who else could it be? Here is an excellent book and written in a polite manner. So where do we find this “marvel” in the Koran? “And his wife was standing (there), and she laughed: But we gave her glad tidings of Isaac, and after him, of Jacob” (11:71). All I can see is a statement of fact. I still don’t see any reason to marvel. LOL, and all I can see is denial from you clowns. Like I said, the only plagiarism is in your Bible. You worship Baal, the “storm rider” and El, an aging god seated on his throne. We should call you Ignoramus the Canaanite, because you worship Canaanite gods! > An illiterate trader (Muhammad) cannot plausibly be expected to have read and understood the Hebrew word play in Genesis 18. If so, I cannot see anything surprising here. An in depth study of the Quran by Raouf Abou Seida, former senior translator in the United Nations demonstrates that this feature abounds in the Qur’an for virtually every non-Arabic names in the Qur’an and there are many non-Arabic names in the Qur’an such as Hebrew Prophets, etc. The study can be read in a book entitled the The Onomastic Miracle in the Koran. This is a miracle that very few people are aware of. I hope people can read the book which is very well written. The book substantiates that the Koran, which has been revealed in Arabic, explains precisely, within its context, the literal meaning of every non-Arabic proper names cited in the Koranic verses, irrespective of the particular language from which the particular proper name was derived, even if the language in question, such as the Old Egyptian, had been extinct for several centuries before the time of revelation. The book is a great endeavor to explore a new miraculous feature of the Noble Koran that has ever been veiled. Omer. Ok, but I am still waiting for some evidence that Qur’an 11:71 states anything other that what is obvious to the story. Guys, could you further explain the whole thing about the line “And his wife was standing (there), and she laughed: But we gave her glad tidings of Isaac, and after him, of Jacob” (11:71). I just don’t understand what is the pun here and which Bible’s line does this refer to. Please. Read Gen. 18 which describes how Sarah, the elderly wife of Abraham, laughed when God and/or his Angels told Abraham that Sarah would give birth to a son. Later when Sarah does give birth to a son, Abraham names him Isaac means “Laughter” or “laughing” thus the pun. 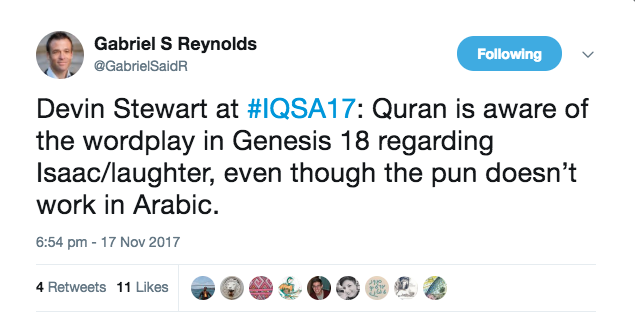 The Qur’an mentions Sarah Laughed (faDaHikat) in the same line as Isaac’s name is mentioned, “Ishaaq” (in Arabic), (Qur’an 11:71) thus recognizing the wordplay or pun in the Torah, even though it doesn’t work in Arabic because the Arabic name “Ishaaq” does not mean laughter in Arabic. The Arabic word “yaDhak” (laughing) which comes from the rootword “DaHak” (Laughter) sounds a little more similar to the Hebrew name “Yitzhaq.” The question is why didn’t the Qur’an use “YaDhak” as the name for Isaac as that would have helped the pun make more sense in Arabic language? It must be remembered that Yitzhaq is a Hebrew name. However, Hebrew was not an existing language in the time of Abraham, as he himself spoke either Chaldean, Akkadian, or possibly some other related Semitic language in which he received revelations from God. The Hebrew language developed long after the birth of Jacob (Israel). So the original name of Isaac was not a Hebrew name to begin with. In the ancient language that Abraham spoke Isaac’s name may or may NOT have meant laughter. Furthermore, it could be theorized that the wordplay between Yitzhaq and Sarah laughing could have been subsequently inserted or embedded into the text by Hebrew scribes long after the original events had occurred. It is interesting that the Qur’an does not specify that Isaac’s name means “laughter,” but only mentions of Sarah that, “she laughed.” Likewise, the Qur’an does not indicate that Abraham named his son any derivative of the word “laugh.” Therefore, it is not required that the Arabic name used in the Qur’an, “Ishaaq,” necessarily reflect the meaning of laughter, since that may have not even been the original meaning of the name in whichever revelatory language that God communed with Abraham in. It could be possible that the Arabic name “Ishaaq” may have its etymological root in the Arabic word “YaDhak.” Some have argued this way in the past, but I don’t think it is absolutely necessary. Thus, the Qur’an implicitly recognizes the later Hebrew wordplay; and simultaneously communicates Sarahs incredulous demeanor; as well as the birth of Isaac; without resorting to any etymological name changes like a human author might have. The fact that the Qur’an does all of this, while setting the record straight by staying true to the original revelation sent down to Abraham is highly remarkable. This, all combined, lends further credence to the divine authorship of the Qur’an. > The Qur’an mentions Sarah Laughed (faDaHikat) in the same line as Isaac’s name is mentioned, “Ishaaq” (in Arabic), (Qur’an 11:71) thus recognizing the wordplay or pun in the Torah, even though it doesn’t work in Arabic because the Arabic name “Ishaaq” does not mean laughter in Arabic. This does not show that the Qur’an recognised the wordplay or pun at all. The verse does not connect Sarah laughing to the choice of name. It is simply giving a summary of the story from the Bible. There is nothing miraculous about this. This phenomenon (i.e. the fact that meanings of the names are embedded in the verses) is not restricted to the name Issac. It , also, happned with the name Jacob in the same verse. Also, the name Zakariah ( ذكر رحمة ) and Yahya ( حنانا من لدنا ) in surat Maryam. Moreover, the meanings of names Ishmael & Musa as the brotheres mentioned above. It’s quite interesting, and it’s definitely something capturing the attention. You’re so fundamental guy to see that , it seems . > This phenomenon (i.e. the fact that meanings of the names are embedded in the verses) is not restricted to the name Issac. It , also, happned with the name Jacob in the same verse. Also, the name Zakariah ( ذكر رحمة ) and Yahya ( حنانا من لدنا ) in surat Maryam. Moreover, the meanings of names Ishmael & Musa as the brotheres mentioned above. It’s quite interesting, and it’s definitely something capturing the attention. Ok, then please back up your claim with some evidence. There has been no evidence offered at all to date. Man, this phenomenon is just there. You can see/read it within verses themselves, and that why seemingly those non muslims scholars have concluded that Qur’an is ware of the pun in Genesis 18. It’s weird that this pun is supposedly in the Koran except it doesn’t work in Arabic and no one listening to muhammad would have understood it. It’s only by reading the Koran in light of the Bible that one discovers this miracle. So I guess the bible is there to interpret the Koran? I guess your stupidity is out of limit. This’s the result when you worship a human being, christians. Well brother Abdullah, to be fair, Cerbie isn’t exactly the sharpest tool in the shed. Give the guy a break. It depends on how you understand the verse and the name. As I alluded to above (and sorry if I wasn’t more clear on this) if you take the understanding that the etymology of the name Ishaaq is related to the word Yadhak then the Qur’an is clearly aware of the wordplay/pun in 11:71. Again: Hebrew “Yitzhaq/Isaac = Arabic Yadhaq/Ishaaq. Therefore, Yitzhaq = Ishaaq with both carrying a derivative meaning of laugh. However, as I also previously stated there is another view which I outlined above that I think addresses Paulus’s comment above. One can understand 11:71 in relation to the Torah verse….or NOT!! Whichever way one chooses to understand the verse, exactly or more flexibly, there is still an awareness of the wordplay/pun. One can adopt either approach optionally or possibly even both understandings simultaneously at once. Therefore the Ayat in 11:71 is DOUBLY miraculous! Alhamdullillah!! If you studied Qur’an carefully, you would not say that. In that very story Qur’an empathized that angels did not eat.